Armonk Indoor is a great setting for any gathering, from youth birthday parties to school reunions to corporate meetings. Our staff will help organize your event and make it an enjoyable experience for everyone. 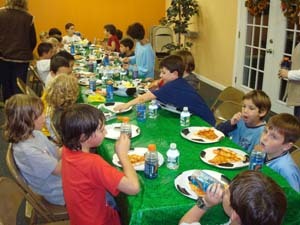 Parties or events can be scheduled for any time of the day during the fall and spring sessions. During the winter (December-March), availability is more limited due to clinics during the week and league play on weekends. However, we have reserved time for one party each Saturday through the winter sessions. There is also availability during scheduled school breaks and shortened days. Learn more below, then download the party form or contact us at info@armonkindoor.com so we can start planning your event. 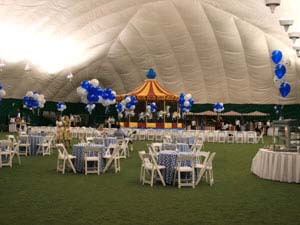 Parties on Armonk Indoor's turf field can include games such as soccer, baseball, flag football, dodgeball, Capture the Flag, and relay races. We also have a Gaga pit, and past parties have even featured inflatables. Once everyone is finished playing, there is comfortable space to enjoy food and drinks. Of course, you can also party on the other side of the facility. Our four tennis courts will ensure that everyone gets ample playing time. For parties that are a little mellower, we offer arts & crafts activities. We create a fun, enthusiastic environment for all partygoers. Events for the adult crowd range from casual parties to elegant fund raisers. Whatever the occasion, Armonk Indoor will help make it a memorable one.